Providing our patients with high quality clinical care is our top priority. We know how important it is to patients and their families to know that when they have to come into hospital they are going to receive the best possible care, be safe and cared for in a clean, welcoming and infection free environment. That is why we are continually implementing quality improvement initiatives that further enhance the safety, experience and clinical outcomes for all our patients. Our Quality Account outlines how we intend to go even further during the coming year and beyond to build on this solid foundation. We will continue to promote a culture of continuous quality improvement and encourage our staff to innovate and adopt ‘best practice’ in order to deliver the highest standard of care to our patients. You can also read a summary of our quality developments, improvements and priorities for next year by reading the Making a difference summary report. Click here to read. We know how important it is to patients and their families to know that when they have to come into hospital they are going to receive the best possible care, be safe and cared for in a clean, welcoming and infection free environment. For reports going back further, please email contact Sue Butler, Head of Patient and Healthcare Governance. Every year we set priorities for improvements in both our clinical care and customer service. We then report how we have performed and outline future improvements which we intend to make. The priorities are based on feedback we receive from patients, staff and other organisations. 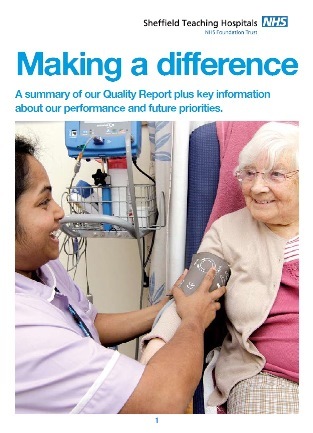 You can read a summary of our quality improvements and the priorities we have set for next year by reading the Making a difference summary report.